The summer before my ninth birthday I decided I didn’t like my name. I had more than one reason for desiring a new name. To begin with, I didn’t know anyone else with the name Paige. It was unusual. There were no stores that sold bike tags or key chains with my name printed on them. In a world of girls named Jennifer and Melissa, my name stuck out like a sore thumb. And all I wanted was to just blend into the crowd around me. It seemed to me most of my friends had nicknames. Cynthia went by Cindi. Virginia was known as Ginger. We called our friend Melissa by the shorter version, Missy. There was no cute nickname for Paige. Another sticking point for me was the fact that Paige was actually my middle name. Almost everyone I knew went by their first name. My parents had decided, prior to having children, to making a tradition of using their children’s middle names. Both of them used their middle names, so it seemed like a great idea to them. With that in mind, my parents had picked out the names for their children with the intention of using middle names more than first names. Middle names aren’t so bad, as long as you don’t care about your doctor or your insurance agent forever referring to you by the wrong name. And finally, there was the story of how my mother arrived at choosing my name. Other kids I knew were named after a beloved aunt, in honor of a grandmother, or perhaps their mother’s favorite soap opera star. Even my own sister was named after my mother read a novel with a character named Brooke. My name? According to the story my mother always told me, she “found” my name on the sign of a veterinary clinic, where the vet was a Dr. Paige, Paige being his last name, of course. As if it weren’t already bad enough that my name came off of a sign, I spent the rest of my growing up years with nightmares about falling in love with some man who had the last name Page. I could not imagine anything more devastatingly awful than becoming Paige Page. I was Angela Paige Terry … the girl with three first names. Back to the summer of 1981. Between the typical summer activities of swimming, Vacation Bible School, and visiting my grandparents in TX, I was enormously excited over the royal wedding of Britian’s Prince Charles. Like all the other girls my age and older, I was caught up in the pomp. I convinced my mother to buy me every magazine with a photo of the royal couple. 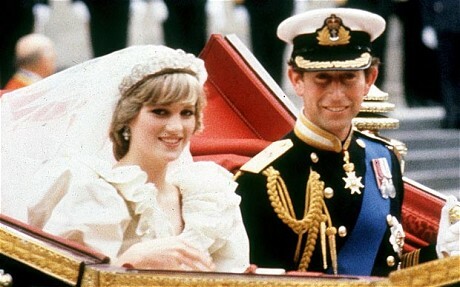 And though there was no internet connection in those days, I collected even the tiniest of details about the Prince Charles and his bride-to-be. My mother even agreed to allow me to wake up at 4 am on July 21st so I could watch the wedding take place in real-time. But thirty plus years later, more than the remembering the specifics of their fairy-tale wedding, I recall most being enamored with Lady Diana Spencer. And while I adored everything about her, mostly I loved her name. To my young ears, it was definitely the most regal name I had ever heard. In the depths of my heart, I knew I, too, was meant to be named Diana. For months, maybe a year or more, I quietly brooded about my name. If only I could figure out a way to get everyone to call me Diana, then my life would be perfect. One day I discovered from a discussion at school about how names could legally be changed, a fact I had not previously known. Now, I began to plot in earnest. Surely there must be some way to convince my mother to allow me to legally change my name to Diana. My mother is not an easy woman to convince. She can be surprisingly stubborn. To my astonishment, she didn’t agree with a single one of my long list of judgements against my name. In fact, she thought Paige was a perfectly wonderful name. Initially, I was heartbroken. I had fully expected her to jump on board with my idea, and when she didn’t … well, I felt discouraged and hopeless about having to go through life with my terrible name. However, I decided not to give up too quickly. Again and again, I approached my mom with my request. Unfortunately, I had no success. My mother would not be moved. Paige, if you really want to change your name, it’s okay with me. However, since your father and I will be the ones paying for this name change, I think it’s only fair we get to choose your next name as well. Thank you, but that’s not necessary. Your father and I have already chosen your new name. We agreed you should be named after your great-great-grandmother, Urilla Xerenia. What do you think? Suddenly, Angela Paige didn’t seem like such a terrible name after all. At some point between jr. high and college, I began to like my name a little better. This wasn’t an overnight decision, but more of a slow process. To begin with, as I traveled with various high school clubs to rallies, contests and conventions, I actually began to meet other girls with the name Paige. I wasn’t as alone as I originally thought. As I would meet new people for the first time, I would often receive comments on my unique or pretty name. I began to take these as positive compliments instead of continuing to view them as negatives. But the day I really learned to love my name was the day God gave it back to me. Like any good gift, God’s gift to me came at the perfect time. In the summer of 2007, my then husband left me and our three children. The months that followed were the darkest of my life. At 34 years old, my life felt over. I could not imagine rising up from the pit where I sat. Not only did I feel completely unloveable, but I also wondered how could God ever use me again? During this time, God continuously reminded me of His love for me. Almost daily for those first six to eight months after he left, I received unexpected cards, letters, and even packages from friends all over the nation, many of whom I barely knew. Emails flooded my inbox, most of them containing scriptures and prayers being said over me and my children. And one night toward the end of that dreadful summer, I received a phone call from a lady I really didn’t know at all. I had never met Sheila in person, but knew of her from an online forum where we both participated. We had never exchanged private communications, and all I really knew about her was she lived in Tennessee and homeschooled her preteen son. To this day, I have no idea how she found my phone number, or what motivated her to call me when she did … other than she had been given exactly what she claimed: a message to me from God. Unlike most other phone calls, this one wasn’t much of a conversation between two people. Rather, she called to give me a message. She spoke. I listened. And to this day, what she had to say gives me the sort of chills that can only happen when God is involved. Your parents named you Angela Paige. The name Angela means “angel.” We often think of angels as being winged creatures playing harps. Yet, in heaven angels are servants of God and have many purposes. One of those purposes is to deliverer of God’s messages. In scripture we read over and over about God sending angels to earth to bring forth messages to humans. The name Paige is directly in reference to the job of a page, or a young servant to a king. Pages were just general errand boys, doing whatever the king might need. This job often included bringing messages to various parts of the castle or even other locations. You are named Angela Paige. You are a servant to the King of Kings. God has chosen you to be His mouthpiece. You will be used to deliver His message of love, peace, joy and encouragement. Ten minutes after the phone rang, I sat in complete silence, amazed God would reach down to me at the lowest point in my life and call me to speak for Him. Throughout the Scriptures, there are recorded instances of times when God renames people. He gave Abram and Sarai new names: Abraham and Sarah. A man name Jacob is renamed Israel. In the New Testament, Jesus began to call Simon by a new name, Peter. And after his conversion, Saul’s name was changed to Paul. I’ve known other Christ-followers, my husband included, who felt like the Lord gave them a special name, something significant on which they could mark God’s personal and intimate knowledge of who they were created to be. But God didn’t give me a new name. Instead, He gave me the same name, along with a reason to love it. What’s the story behind your name? Do you love it or hate it? Has God ever given you a new name? If you have ever received believing faith in Christ, then He has your name written in the Lamb’s Book of Life, and that’s more important than any name we might go by here on this earth. 🙂 LOL … well, I cannot imagine my mother being negotiator in either business or diplomacy. She was an elementary school teacher … I suppose all those years in the classroom enabled her to develop a sixth sense about children and their manipulations. 🙂 However, I must say my mother is a very wise woman. A gentle, quiet woman who has a knack for saying the right thing at the right time. If only I could be like her in this way!